SNOWGRIP is a new "first of its kind" snow retention coating for metal roofing. SNOWGRIP provides incomparable snow retention capability as well as easy installation, affordability, energy savings, enhanced roof performance and more. SNOWGRIP will not promote ice dams like other snow retention systems may. 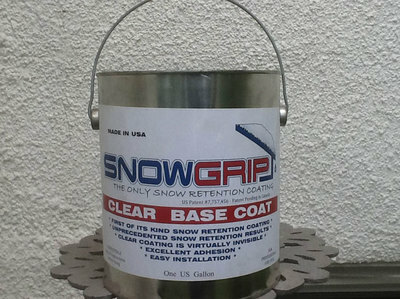 The SNOWGRIP two-part Monolithic Abrasive Snow Retention Coating for metal roofs is designed to coat the entire roof to prevent any portion of the snow pack from beginning to slide. 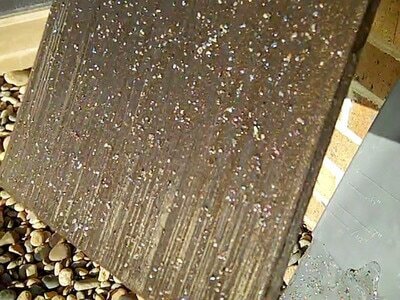 The base coat is a clear roof coating that compares to the best in the industry. 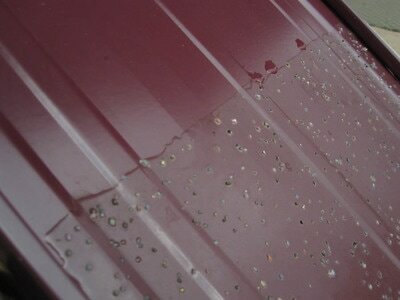 The base coat is applied over the entire surface of a clean dry metal roof. 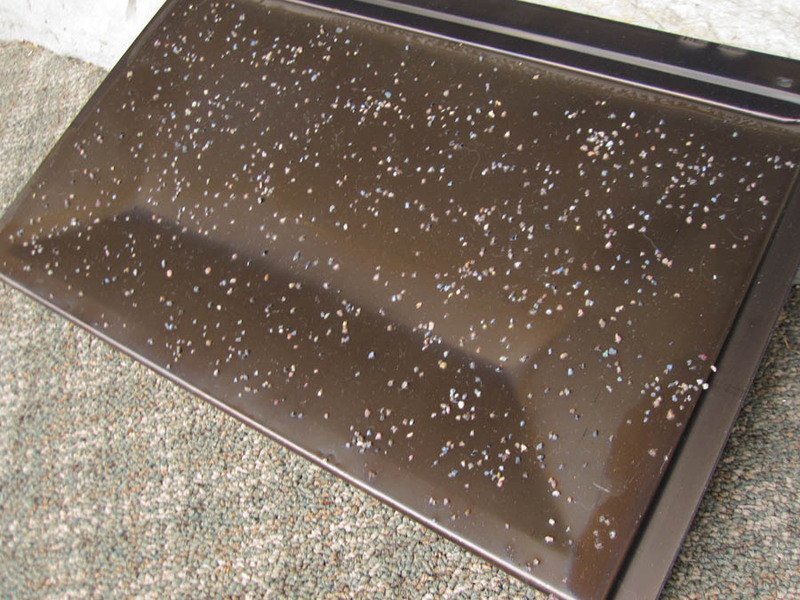 While the base coat is still wet, special abrasive aggregate granules are uniformly broadcast over and settle into the base coat. As the base coat cures, it bonds to the metal roof surface and secures the abrasive aggregate granules in a position that protrude from the surface of the cured rubber base coat. 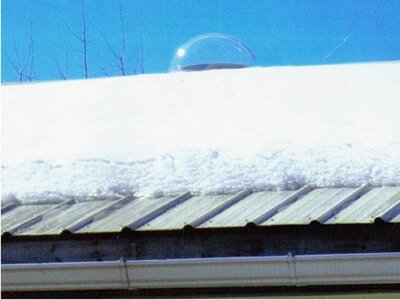 The snow blanket that covers the SNOWGRIP surface transforms into a consolidated snow pack as the melt water flows toward the SNOWGRIP surface and refreezes. The majority of the upper snow pack becomes a uniform lightweight dehydrated insulating snow layer as the moisture flows out of it. The icy base of the snow pack conforms to the multitude of aggregate granules, creating a bond unlike any other snow retention system. 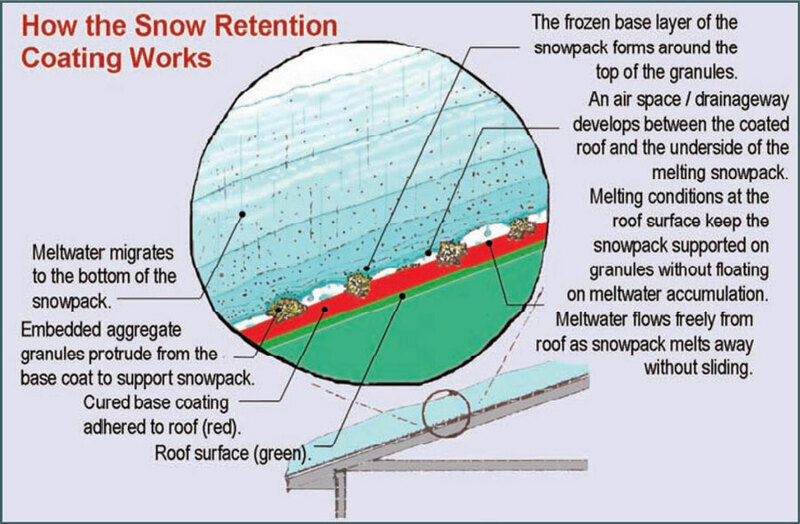 Since the surface of the roof is covered and protected by the insulating snow pack, the surface temperature of the roof stays warm and promotes a gradual and continual melting of the bottom of the snow pack. 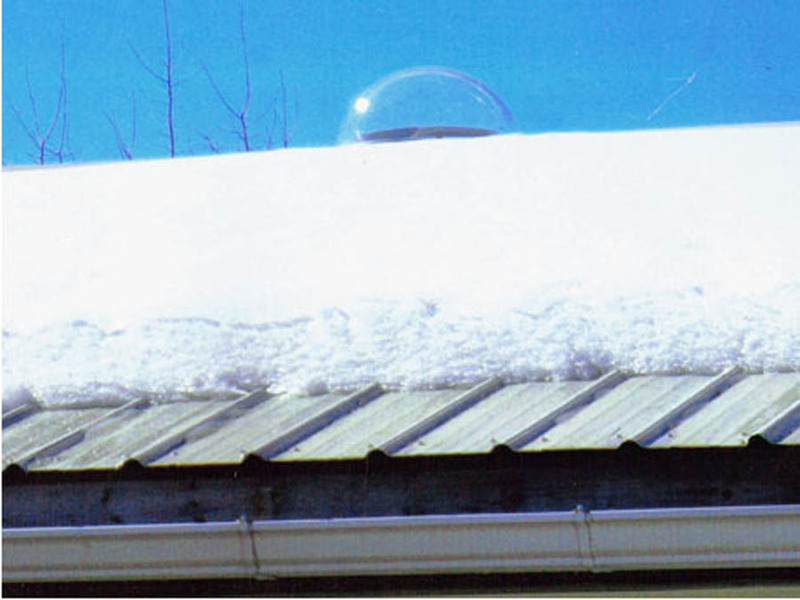 As the melting occurs, the snow pack is uniformly supported on the tops of the granules, can't settle in tight contact with the roof and an air space/drainage way is formed between the roof and the snow pack. 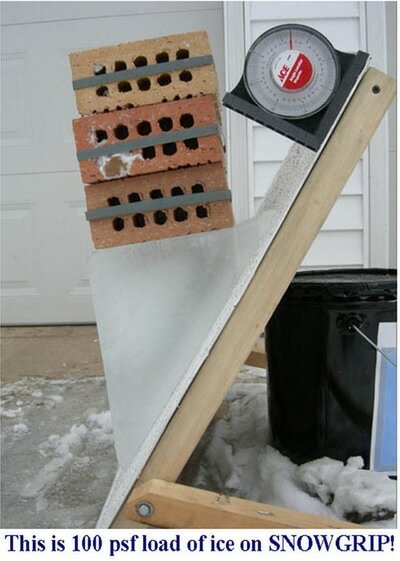 The melt water efficiently and safely flows off the roof through the air space, under the insulating snow pack and between the raised SNOWGRIP granules until the snow pack melts away completely. 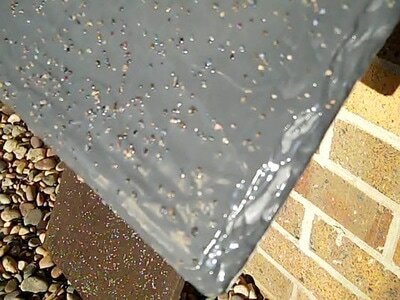 The US patent for our Snow Retention Coating was granted after the release of this early video. 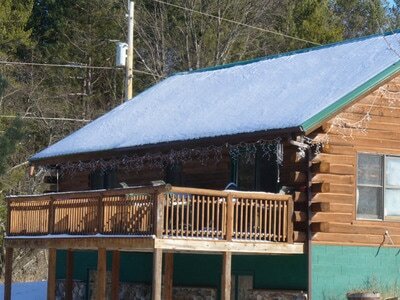 There have been numerous advancements in the product since it's original release. 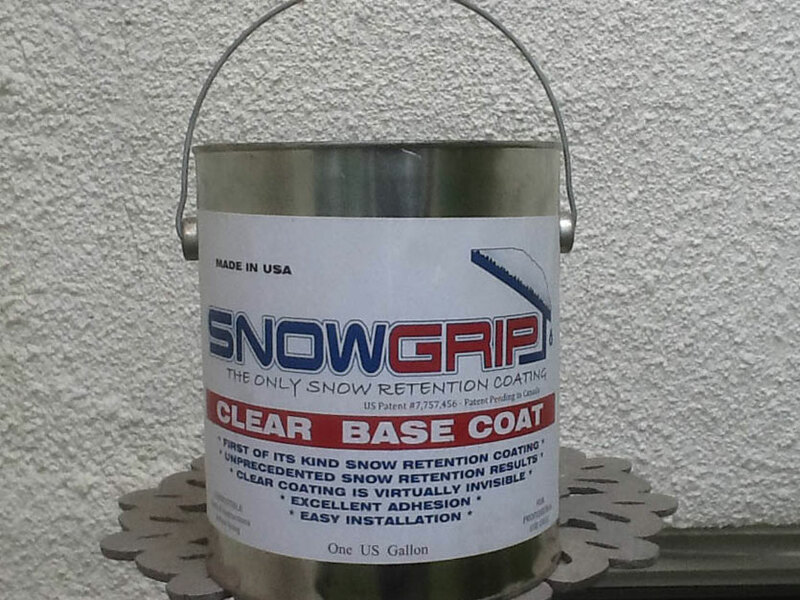 SnowGrip is now exclusively packaged with a clear base coat.